"41HS13, 2003.08.452, Burial 3" by Timothy K. Perttula and Robert Z. Selden Jr.
DECORATION (INCLUDING MOTIF AND ELEMENTS WHEN APPARENT): The vessel rim has engraved rectilinear panels and overlapping horizontal-vertical lines, while the vessel body has four sets of meandering scroll bands that end in hooked arms. The areas between the scroll bands is filled with numerous negative ovals and rectangles outlined by excising. 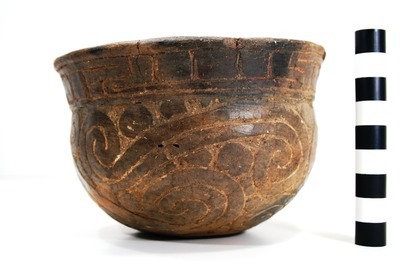 Natchitoches Engraved carinated bowl, Burial 3, Susie Slade site.